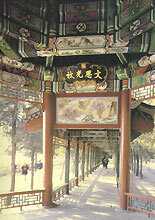 The Long Corridor with its exotic paintings is known throughout the world. Situated at the foot of the Longevity Hill and opens onto the Kunming Lake, this 273-span affair begins at the Gate for Inviting the Moon and runs for a total distance of 728 meters through the Cloud Dispelling Gate, four pavilions and two waterside chambers, until it reaches the Pavilion of Master Stone at the western end of the Longevity Hill. Its eaves are gaily painted with pictures of lotus flowers blooming on ponds, birds flying through forests, fish swimming in water, pavilions and chambers, and landscape. Some of the paintings tell about history and historical figures. A stroll along the corridor enables one to marvel at the paintings and the scenic Kunming Lake and the buildings on the Longevity Hill. Like a floating ribbon, it knits the various scenic spots into an integral whole.